Paris Riots: France burns in worst civil unrest in 50 years; who are the Yellow Vests? 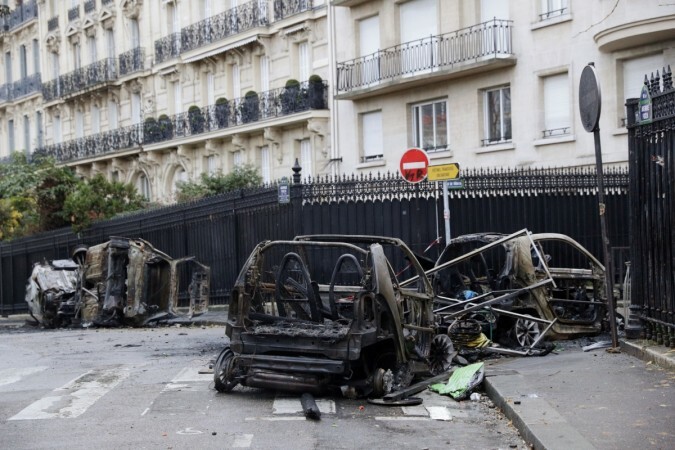 Masked protestors torched buildings, cars, and police posts and even looted shops in Paris. They carried clubs and axes and rampaged through monuments, supermarkets and other buildings. The iconic Arc de Triomphe was among the hundreds of buildings attacked. France is reeling under its worst civil unrest in the last 50 years. Calling the riots "the start of a revolution," masked protestors, over the weekend, torched buildings, cars, and police posts and even looted shops in Paris. 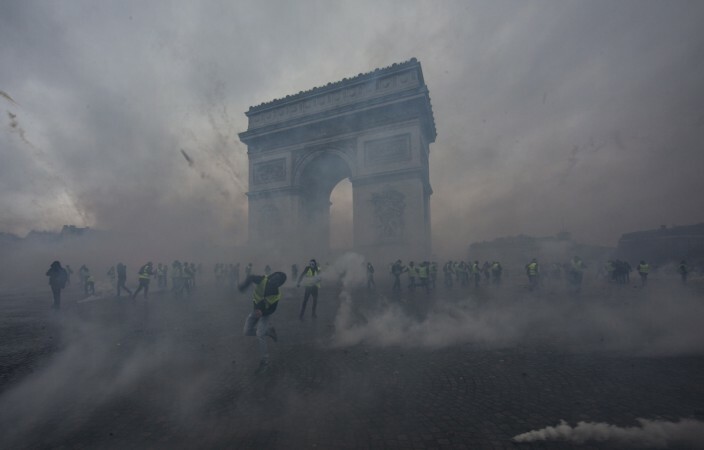 Protesters, many of whom are said to be thugs, carried clubs and axes and rampaged through monuments, supermarkets and other buildings in Paris. The iconic Arc de Triomphe was among the hundreds of buildings attacked and streets were lined with torched vehicles. The riots have led to the arrest of over 400 people, and injured about 150 others, including 23 security personnel. The police have now called for a State of Emergency to be declared and the Army has also been asked to take to the streets as anti-government "Yellow Vest" fuel price protesters refuse to back down. 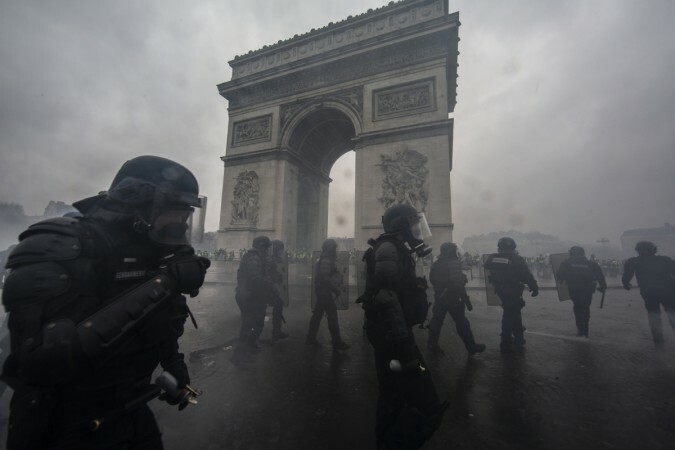 Frederic Lagache of the Alliance police union said that army reinforcements would guard national monuments in Paris and stated: "We are in an insurrectional climate," reported the Sun. Protestors have defaced several buildings and monuments demanding Macron's resignation and the words "Macron Demission" was seen painted on the Arc de Triomphe. The monument also carried the words "The Yellow Vests will Triumph." The protests in France come 18 months into Emmanuel Macron's presidency and are in response to his administration's move to hike fuel tax in the country. Residents took to the streets in Paris to express their disapproval of the policy and believe that the move is in favour of the wealthy. While the unrest started on November 17 and was largely peaceful, it turned violent and got out of hand on Saturday, December 1. It has now become much more widespread reaching cities such as Charleville Mezieres in the northeast to Marseille in the south, reported Reuters. The Yellow Vests are protesters who are a part of the Yellow Vests Movement called the "Mouvement des gilets jaunes." 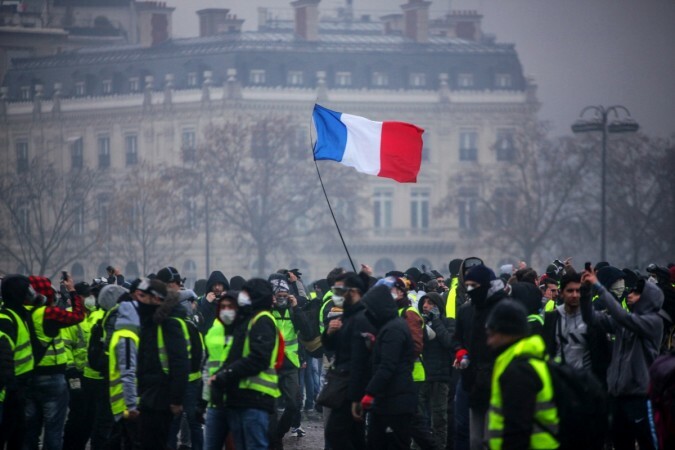 The protesters chose to don yellow vests for the protests as it is mandatory for all motorists in France since 2008 to have high-visibility vests in their vehicles when driving, hence making these vests easily available, inexpensive, and symbolic. What does the French government have to say of the protests? French president Macron, who was in Argentina for the G20 summit, told a news conference thus: "I will never accept violence." Once home, he asked Prime Minister Édouard Philippe to hold talks with protest groups. Government spokesperson Benjamin Griveaux said that the officials had discussed the matter and revealed that while the Macron admin was open to talks, it would not roll back the fuel tax hike. "We won't change course. It's the right direction. We are certain of that," Reuters quoted Griveaux as saying.